I like old cars,they’re just beautiful. In the old good days the car manufacturers used to build very unique cars, build to last forever. I was very surprised to see some VW beetles in the streets of Muscat and yesterday I came across this lovely Land Rover Defender 110 parking in front of busy shopping mall somewhere in the capital. It’s 1985 model, former army pick up.The current owner restored it and is for sale. Really nice one!The car indeed. 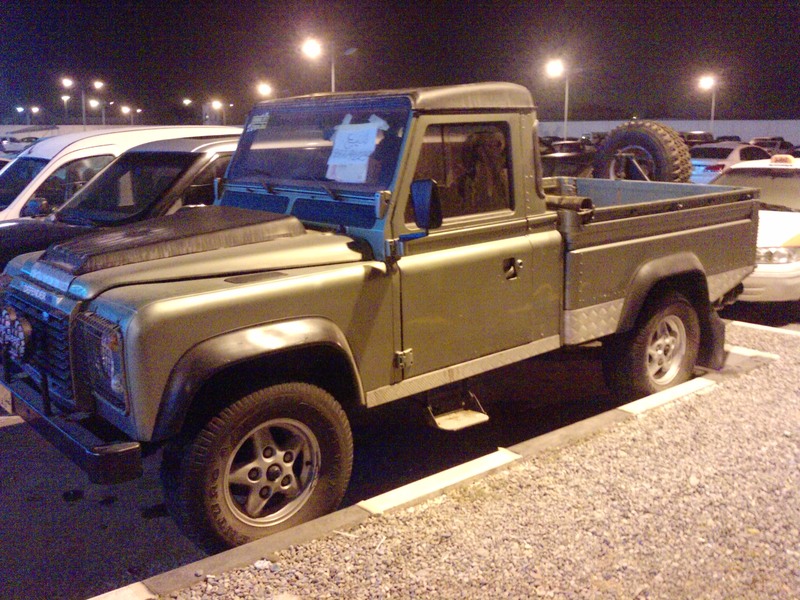 This entry was posted in Muscat, Pictures, Uncategorized and tagged cars, defender, landrover, pick up. Bookmark the permalink. yes id like one of those too…….ive got two scrap beetles ………but only one engine….one im building up to be a beach buggy….the other id like to build up really rough like a fully off road baja bug……..i took the floorpan with out a body on driving in the minedumps…….it is so light an with the 1600 engine you can drive it almost anywhere………. I love aircoolers too. In fact I have VW T2 at home. The aircooler engines are simple to run and very easy to maintain. But you cannot to see many of them here in Oman.